The name Mesopotamia originates from the Middle East and means ‘the land between two rivers’ - the original rivers were the Tigris and the Euphrates. Mesopotamia Station lies between the Rangitata and Forest Creek rivers and was named by Samuel Butler in 1860. 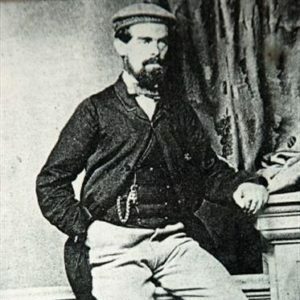 Samuel Butler, English writer and author of the satire 'Erewhon', is the most famous former occupant of Mesopotamia. He first lived in a small 'V' hut in Forest Creek and two months later he moved to the present homestead site. It is from that date in 1860 that Mesopotamia Station came into existence. You can visit the remains of the original homestead and see some Samuel Butler memorabilia, and then wander up Forest Creek to see the original 'V' hut site. Other notable owners include the brothers General and J.R. Campbell and George McMillan. Malcolm Prouting bought the Station in 1945 and it is still owned and managed by the Prouting family. The 'Mesopotamia Logo' was taken from the original stencil which was used to identify every bale of wool which left the station to be sold at auction, originally in England and later in Christchurch, New Zealand. The stencil has been replaced now by modern nylon labels but the original stencil still hangs in the entrance hall of the homestead. The candlestick Logo was the original candlestick brand used on all the cattle and sheep belonging to Mesopotamia. This was used as far back as the 1860's by Samuel Butler. The very original brand is kept in Christchurch Museum, NZ. ‘Mesopotamia Station – first hundred years’ by Peter Newton is available through Mesopotamia Station. 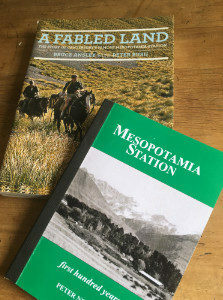 Visitors to Mesopotamia Station can buy the book for NZ$20, but if you require a copy to be sent to you please contact us and we will send one for NZ$25 within New Zealand. ‘A Fabled Land’ by Bruce Ansley and Peter Bush’s photography, reflects on the Prouting family at Mesopotamia. Copies can be obtained from Paperplus and Whitcoulls.